The State Department has turned the page on Turkey for it no longer views Ankara as a reliable US partner. Many argue that Washington will abandon Syria’s Kurds in order to assuage Turkish anger. I doubt this. Washington expects more anti-US actions from Erdogan. Many in DC believe that Turkey’s rising Islamism, hardening dictatorship, and worsening anti-Israel rhetoric will only increase in the future. They do not hold out hope that Washington can reverse this trend. The US is increasingly falling back on support for Israel and Saudi Arabia. Trump has clearly set his course and reversed Obama’s effort to balance Iran and the KSA. Trump has thrown Washington’s future in the Middle East in with its traditional allies; it is moving to hurt Iran and Assad. It’s main instrument in gaining leverage in the region seems to be Northern Syria and the Syrian Democratic Forces. Washington is promoting Kurdish nationalism in Syria. Turkey had hoped that when the Islamic State organization was destroyed, Washington would withdraw from northern Syria. In this, Ankara has been disappointed. See my earlier article of Oct 2017: Will the U.S. Abandon the Kurds of Syria Once ISIS is Destroyed? By keeping Damascus weak and divided, the US hopes to deny Iran and Russia the fruits of their victory. Washington believes this pro-Kurdish policy will increase US leverage in the region and help roll back Iran. The Acting Assistant Secretary of the Bureau of Near Eastern Affairs, David Satterfield, explained to the Senate on January 11, 2018 that US policy is designed to convince the Russians to see that a new constitution for Syria is written and that fair elections, overseen by the UN, are carried out such that Assad will lose. By denying the Damascus access to North Syria, the US says it is convinced it will achieve these stated ends. I am unaware of any analysts who believe this. It is completely unrealistic. Russia, even if it wished to, cannot force Assad to make such concessions. Most analysts brush off such State Department formulations as talking points designed to obscure more cynical objectives. Washington recognizes that its pro-Kurdish policy is forcing Turkey into Russia’s arms, but it seems willing to risk this loss. It is not at all clear what good Erdogan can achieve by invading Afrin. It will not hurt or weaken Washington’s relationship with the Kurds in Eastern Syria. Most likely, it will do the opposite. Those in Washington who see Turkey as an unreliable and misguided partner will only have their negative views of Turkey confirmed. The Kurds will be inflamed. The YPG and PKK will cooperate more closely to mobilize the Kurds of Turkey. For this reason, I believe Erdogan will not invade. He is trying to bring attention to his unhappiness, fire up his base, and prepare for elections that are approaching. But I doubt that he plans to occupy Afrin. He may lob cannon fire into Afrin, as he has done these past few days, but I suspect his ire will end there. America’s current Syria policy is designed to roll back Iran. This is short sighted. The PYD, or Kurdish leadership in North Syria, is a weak reed upon which to build US policy. Neither Assad nor Iran will make concessions to the US or Syria’s opposition in Geneva because of America’s support for the Syrian Democratic Forces, the military force that now controls North Syria and which partnered with the US to defeat ISIS. (It has been named and armed by the US and is led by Kurdish forces who answer to the PYD.) The continuing presence of the United States in North Syria will provide only limited leverage over Damascus. By controlling half of Syria’s energy resources, the Euphrates dam at Tabqa, as well as much of Syria’s best agricultural land, the US will be able to keep Syria poor and under-resourced. Keeping Syria poor and unable to finance reconstruction suits short-term US objectives because it protects Israel and will serve as a drain on Iranian resources, on which Syria must rely as it struggles to reestablish state services and rebuild as the war winds down. The US should be helping the Kurdish leadership of North Syria to negotiate a deal with Assad that promotes both their interests: Kurdish autonomy and Syrian sovereignty. Both have shared interests, which make a deal possible. Both see Turkey as their main danger. Both need to cooperate in order to exploit the riches of the region. Both distrust radical Islamists and fear their return. Neither can rebuild alone. Syria’s Kurdish regions need to sell their produce to Syria and to establish transit rights; Damascus needs water, electricity and oil. Of course, policing any deal between the PYD and Damascus will not be easy. Northern Syrians will look to Washington to help guarantee their liberties. But helping both sides to strike a deal sooner than later is important. Today, demands are not entrenched, institutions and parties are not established, and borders are not fixed. Tomorrow, they will be. The US should allow the building of oil and gas pipelines that connect the rich fuel deposits of Iraq and Iran to the Mediterranean. Rather than thwart Syria’s efforts to rebuild, the West should allow them to go forward, if not support them outright. The only benefit to come out of the terrible wars that have waged in the northern Middle East is that today the governments of Beirut, Damascus, Baghdad and Tehran are on friendly terms. This is the first time in a century that cooperation between the four countries is possible. Why not use this happy coincidence to promote trade and economic growth? Why not allow governments to criss-cross the region with roads, communication highways, trade, and tourism? Jordan is eager to re-establish its main trade route through Damascus to Beirut, which remains closed. Several rebel groups are holding onto the border region, over which Russia and the United States negotiated a cease-fire or “deconfliction” zone. The same is true for the main highway that connects Baghdad and Damascus. It is closed due to the US military zone established at the Tanf border crossing. This US position serves no purpose other than to stop trade and prohibit a possible land route from Iran to Lebanon. Iran has supplied Hizballah by air for decades and will continue to do so. What the US does accomplish with this policy is to beggar Assad and keep Syria divided, weak and poor. This will not roll back Iran, but it will go a long way to turn Syria into a liability for both Iran and Russia rather than an asset. But the problem with such a policy is that it is entirely negative. It is designed to punish and impoverish; it provides not vision for a brighter future. The U.S. will rightly be seen as a dog in the manger. The reconstruction of Syria should be seen to be in the West’s interest. By allowing Iran and Iraq to build pipelines across Syria to Tartus or Tripoli, the West will ensure that the European Community has gas & oil. The United States would ensure that the Levant looks toward Europe, rather than Asia, in the future. Europe would gain a much needed energy source to compete with Russia. Most importantly, by building trade, the Levant countries and Iran could provide jobs for their young. Nothing is more important for promoting stability and regional health than jobs and a brighter economic future. It would help America’s counter-terrorism goals more than any other single endeavor. All analysts are unanimous in pointing to poverty and joblessness as causes of the Arab Spring uprisings and radicalization. A revitalized economy in the Levant would encourage refugees to return home. The burden on Jordan, Lebanon and Turkey of hosting so many millions of refugees would be alleviated. Rather than become embittered as did the Palestinians, Syria refugees could rebuild their lives and see light at the end of the tunnel. The present US administration is not ready to pursue such a policy. I simply propose it because it makes senses and seems so obvious. The US hopes to gain leverage against Assad by stopping trade and hurting his military. By allowing for economic growth in both the Levant & Iran, the US would provide jobs and hope, not just to these countries, but also to their neighbors that depend on regional prosperity. Such a policy would promote moderates over hard liners. The present anti-Iran and anti-Syria policy will produce more bitterness and years of turmoil, without achieving American goals. It will not cause Assad to break his relations with Iran or to transfer power to the Syrian opposition. It will hurt the US in the long run, as surely as it hurts the people of the region. Ultimately, the promotion of wealth and a strong middle class in the Middle East are America’s best hope. This principle of prosperity was once the mainstay of US foreign policy; it won the US respect around the world. Today, sanctions and military intervention have become the mainstay of US policy. Free trade, the rule of law, and respect for national sovereignty have been pushed aside. Democracy promotion has become a codeword for hurting US enemies and an cynical instrument of regime-change. Rarely does the US promote democracy to friendly potentates. U.S. foreign policy has slipped its moorings. Only by returning to the simple truths that prosperity will advance U.S. interests will the US begin to put an end to terrorism, promote democracy, and attenuate the flood of refugees that pours from the region. Democracy, moderation, and the acceptance of liberal values will only come with education and economic growth. There is no quick fix to the regions problems. Ensuring that Syrians and Iranians remain poor in the hope that they will demand regime-change is a bad policy. It has not worked despite decades of sanctions. It has brought only collapse, war and destruction to the region. Dividing Syrians and keeping them poor may ensure short-term US interests; it please some of America’s allies; but in the long-term, it will ensure failure and more wars. Only by promoting growth and unity can the United States advance stability, the rule of law, and liberal values. Interesting point of view, especially the last paragraph. Considering that the U.S. is the elephant in the room, along with Israel pulling the strings, the chances of any real movement toward such goals, seem slim to none. Hard to change what has become habitual, as in war and destruction, that is the hallmark of the war on terror. As I’ve said many times before, the MENA has the ability to become a real powerhouse if it could come together, bringing prosperity to all. Instead of wasting money/resources on making war, with its resulting destruction of both lives and property, said money could rebuild, tap into education and build the needed infrastructure. Perhaps if the U.S. retreated to its own borders and left the disputes to be handled by the countries involve, we wouldn’t be where we are today? You are an academic living in a country which champions human rights and freedom which you must cherish and value. Yet in your article you support the USA accepting and working with a regime that dropped tens of thousands of random barrel bombs on its people. Nothing can justify this crime of random killing of every section of society. How can your mind and heart accept this? Dear Fares, I do not condone Assad’s monopoly of power. I do ask Washington not to actively stop trade between Syria and its neighbors or to block roads and trade into Syria. I don’t believe blocking trade will achieve the ends that Washington claims it will. I do believe it will stop Syrians from feeding themselves and refugees from returning home. I believe Washington’s experiment with intervention in Syria has increased the number of killed and human rights violations rather than reduce them. We have seen that the West and the Gulf countries that championed Syria’s opposition and rebel militias were unwilling to escalate faster or higher than Russia and Iran. I do not blame this on the West alone. The West was spooked by spread and dominance of radical militias. It turned against the revolution it had initially promoted and allowed Russia and Iran to bolster the Syrian Army. Why did the revolution become so Islamist and why were the revolutionary forces so fragmented? There are many answers to this, I believe. Some can be blamed on Assad and his regime, but many cannot. We have seen the same phenomenon plague revolutions elsewhere in the Middle East, where Assad and his regime had no influence, such as in Libya, Palestine and Yemen. Iraq also had the same outcome although Assad participated in producing this outcome to some extent by permitting jihadists to cross Syria into Iraq. But Zarqawi and the main promoters of radical Islamism in Iraq were not Syrian products. They sprung out of a much broader cultural and economic environment that is pervasive in the Middle East. I admit that there is a vicious circle in the region. Dictatorship dissuades people from adopting liberal values and inhibits the emergence of civil society. Equally, the dominance of Salafi-Jihadist groups encourages dictatorship and spooks the West from promoting revolution. In short, I don’t think the West will provide the answers to the region. It’s policies of military intervention have made things worse. I do not ask Washington to fund the government in Damascus, I am simply asking Washington not to stop Syrians and its neighbors from trying to build roads and common trade. Western sanctions, at this point, are a blunt tool that achieve no political gains and much economic damage. I am simply asking the West to do no harm. Not trying to start an argument, as your comment is true to a point. Mr Landis has brought this conflict to the American audience as no other in the U.S.A. has, from his perspective, not like the think tank denizens that hold sway in Washington D.C. Your line about the barrel bombs hold truth too, but don’t forgive the side who have used the people as shields, nor hide among the innocent. This has done enough destruction, the country needs to rebuild. Looking in the rear view mirror isn’t going to achieve that goal. Keep in mind who the financiers are, regardless of which side you favor. The time to stand up for all the innocent ones, is now, let history write the pages so that perhaps this wont be repeated again as we have seen in the war on terror to date. Cher Joshua. Tu sembles écarter deux éléments fondamentaux de l’équation : la corruption et la dictature. Comment croire que le régime syrien, qui est un régime de prédation, ne continuera pas à confisquer les richesses nées de cette activité économique florissante que tu prédis, et donc à maintenir la terreur au moyen de ses services de renseignements pour éviter toute contestation? La contestation de son pouvoir par la révolution (qu’il a réussi à manipuler avec les puissances régionales en la radicalisant) et son sentiment d’avoir “gagner” la partie ne risquent-ils pas de rendre le régime syrien encore plus paranoïaque et donc plus cruel qu’auparavant, si Assad reste au pouvoir? Quand on voit aujourd’hui ce qui se passe en Egypte, la dictature sous Al-Sissi est encore plus dure que sous Moubarak, on a des raisons de se poser des questions sur la façon dont le régime syrien traitera sa population majoritaire dont il ne manquera pas de se venger. Enfin, tu as l’air de considérer le terrorisme comme produit de la pauvreté. Ne crois-tu pas que le terrorisme est plutôt le produit violent de la dictature et de la corruption? De cette humiliation permanente de populations qui aujourd’hui grâce à tous les moyens de communication savent qu’ailleurs on peut vivre dans la dignité et la prospérité? Ou bien crois-tu que le Proche et Moyen-Orient pour des raisons “culturelles” n’est pas fait pour la “démocratie” et que ses populations sont prédisposées à la dictature, la “démocratie” étant alors considérée comme substantiellement associée à l’Europe et l’Amérique du Nord? Que l’intérêt des Américains passe par la stabilité dans la région, une stabilité garantie par des régimes autoritaires, c’est tout à fait compréhensible, mais est-ce l’intérêt de la majorité des Syriens? Toi qui as vécu en Syrie et qui sais donc que déjà avant la révolution tout Syrien qui ouvre un commerce doit passer par les services de renseignements et que si son commerce est florissant, il est contraint de “partager” ses bénéfices pour ne pas dire céder son affaire sous la pression d’un des clients du régime qui voudra profiter de son bien ou se l’approprier. Crois-tu vraiment que le régime syrien avec sa clientèle laissera prospérer les Syriens? Crois-tu que les Syriens qui ont sacrifié leurs biens, qui ont vu mourir leurs enfants, violer leurs femmes, mourir sous la torture leurs hommes, et utiliser leurs enfants comme de la chair à canon (je pense ici à cette jeune génération d’Alaouites enrôlée et sacrifiée par le régime), accepteront d’avoir fait tout cela pour continuer à vivre sous un régime de prédation incarné par Assad? Comment peut-on espérer une stabilité en Syrie avec le maintien, sinon du régime, du moins de certains de ses hommes, Assad et sa famille? Daesh est autant le produit de l’invasion américaine de l’Irak que des dictatures sanglantes de Saddam Hussein et des Assad père et fils. Penses-tu que ce que tu proposes : soutien aux Kurdes et maintien d’Assad, avec une alliance entre les deux, qui excluent de l’équation les Arabes sunnites de Syrie soient un gage de stabilité? Ne penses-tu pas qu’au contraire c’est renforcer les germes qui ont conduit à la naissance du groupe ISIS? This is a good read. Going back to the simple but valid principles of USA Mideast policy since 1979 which rotate around Iran and Israel. 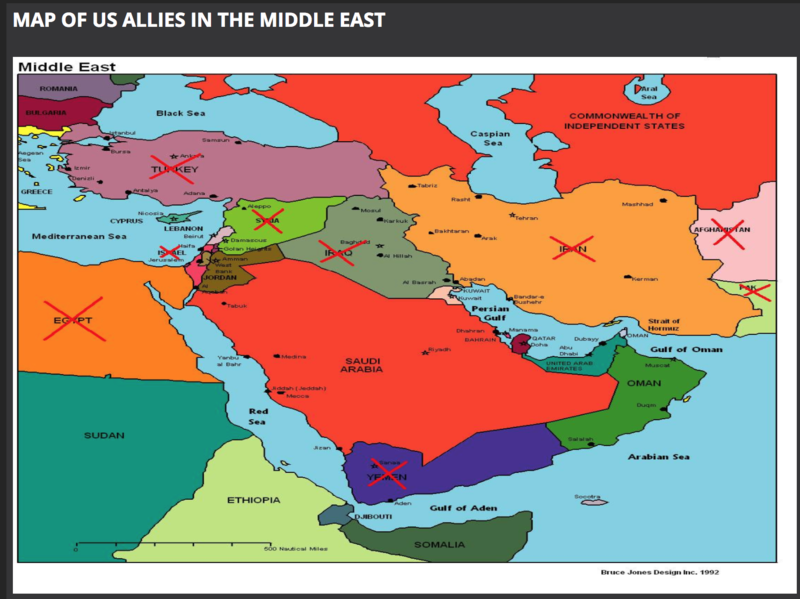 Every action the USA took in the region since 1979 was to support Israel or antagonize Iran. The Syrian rebels and their white collar supporters in the West and elsewhere forgot this basic fact and believed the promises given to them by gulf countries and allowed hatred to cloud their judgement. They even took Nusra as an ally and praised Islamist terrorists openly and still call them ” Muqawamah” !! Assad and the regimen survived because their enemies were naive and did not have real leaders and a national agenda, killing as many soldiers and Alawites / Shia was a policy that helped to recruit young angry jihadists but it was not enough to win public support, people want a better alternative to Assad, rebels gave none. You raise many important questions. I do not have good answers to them all. You are certainly right about the “la corruption et la dictature” of the Assad regime. I do not have a cure for corruption or dictatorship. I do not believe that violent overthrow will reduce corruption or diminish the probability of dictatorship in Syria. But, as you will correctly respond, “without violent overthrow, Assad will not step aside.” You are right. I cannot deny this. It is a vicious cycle. Is poverty the cause of radicalization or dictatorship? I suspect that poverty has a large roll to play only because in places with high economic growth rates or lots of rentier money, such as China or Saudi Arabia, there is not revolution despite having lots of corruption and dictatorship. Most people may actually accept not having a political voice so long as they believe their basic needs will be met and they have a chance of improving their futures. Dictatorship is not always the key to revolt. After all, most of humanity has lived under some form of authoritarian government for most of history, including the French, where democracy is relatively recent. This, of course, does not make authoritarianism good or desirable. There are many causes of revolt. Economy is only one. The desire to get rid of an oppressive ruler is another. The desire for democracy is a third. Do I think that Middle Easterners are inferior to Westerners and thus cannot cope with democracy or don’t deserve it? The short answer is I do not. I continue to have faith in some kind of immanent teleological law of progress. I believe that Western forms of democracy will spread to all corners of the earth. This may not be tomorrow, but I do believe that they will spread because they are the least bad form of government. The real question here is how do we get there? Alawites. You ask about the young generation of Alawites – some 100,000 of who have died fighting to defeat the revolution, which was largely carried forward by Sunni Arabs – and how they can live with themselves or the regime that refused to step down. I am not sure of the answer to this question, but I suspect that they feared being ethnically cleansed and of having their families killed. I believe a lot of the killing in this civil war came down to the basic insecurities of “tribalism.” By this, I don’t mean some anthropological definition of tribe, but of basic identity politics. People are cowards. They fear being killed and will do just about anything to avoid it. How can the brutality inspired by this regime and this civil war be repaired without trials, murderers being held to account, and a complete change? I don’t know whether it can. Like you I am doubtful. Syrians will be filled with resentments for a long time. I don’t have answers for your many important questions, particularly about the future of Sunni Arabs who opposed this regime and fought against it. They are being given no mercy and no place in Syria. They are left out. Like you say, it will produce a terrible legacy and will surely cause much trouble in the future. I simply don’t believe that further war will accomplish good. As an American, I must limit most of my policy proscriptions to what I believe the role of US should be and whether it can play a positive role. I must admit that I have been skeptical about Washington’s ability to do good in Syria. I am sure that this is a product of my many years spent in Lebanon as well as my experience elsewhere in the Middle East. I did not believed that Washington considered the interests of Syrians above those of its more important allies in the region. Anyway, I do not advocate that Washington spend money on Syria or help Assad. I simply recommend that it stand aside for a while and allow local money and regional investors to try their hand at fixing Syria and bringing the economies of the region back to life. I believe that the sanctions now being imposed on so many parties in the Middle East are not constructive and do not promote democracy. I do not pretend to have a solution for Syria and do not wish to defend the Assad government. I simply believe that dividing Syria and hindering local reconstruction will not produce any of the results that Washington claims to want. The United States will have to frame Russia’s absolute hand in Syria, if not through diplomacy, it can be by using the depletion of power. And forcing Iran and Turkey to retreat into their borders. Yes, it is the duty of the United States as a superpower to rearrange and maintain the order between the Mediterranean and Caspian after a long time. “Ultimately, the promotion of wealth and a strong middle class in the Middle East are America’s best hope. This principle of prosperity was once the mainstay of US foreign policy; it won the US respect around the world.” Uhhh, I must be living in a different USA since the one I’m in has, for the last 150 years promoted the interests of the ruling elites at the expense of any other class, and as only brought war, heartbreak, poverty, and anger to all classes disenfranchised to benefit the ruling elites… are you old enough to remember Viet Nam? Iraq? America’s ‘interests’ in Syria are regime-change (for a variety of reasons) to which end it and its ‘democratic’ allies (KSA, Qatar, etc.) along with NATO has employed a Wahhabi/Salafist jihadi mercenary army to pillage and murder anyone who supports the democratically elected (haram) Assad government. The U.S. has no interest (zero, bupkis, nada) in creating a liberal middle class society in the Mideast. To hear such naivete being put forth by a supposedly erudite university professor is profoundly disconcerting. No one will agree with you that you can promote democracy by keeping a brutal dictator and sectarian president in power, after killing million of his people, democracy and dictatorship do not mix. Education and economic growth can promote democracy in the absence of dictatorship, and certainly in the absence of sectarianism. The victory that you talk about was not because of the regime power, but it was because the Russian super power and the opposition of US to support the Rebels against Putin military and diplomatic aid to Assad and the Iranian financial help, Assad did not survive because Syrians supported him but because Russian and Iranian unlimited support. The Islamization of the revolution did not hurt the revolution among Syrians , it hurt the revolution by turning Russia and US against it so they both cooperated against Syrians demands for freedom. The victory you talked about is premature , half of Syria is not under Assad control, part of Syria is occupied by Turkey and part is controlled by SDF a Kurdish control, Syria is destroyed, 11 million are displaced , they are refugees, sovereinty is lost, the fight is still going on., most are saying it may take years before the end of this war. I agree with many of the points. I agree the war has to end, no more killing. I do not agree that the innocents that were killed in the barrel bombing to be categorised as human shields. They are Syrian citizens that were murdered because they did not support the regime. Even If the rebels were the worst terrorists on earth (and hid amogost civilians) a government should not randomly bomb its people. The millions of refugees in Turkey, Lebanon and Jordan primarily left their home because of the bombing. Syria needs a political solution. A big factor in the revolution in Syria was economic but also a major factor is human dignity which has become non existent in Syria. It is possible to be poor and happy but poor and worthless as a human being is awful. The regime is unwilling to change. In my opinion refugees will not return and Syria will not rebuild under an unchanged regime. This regime views any person with even a thought against it should be exterminated or forced out of the country. Their approach to their people will get even worse if they are given full legitimacy. America needs to work with Russia on forcing a compromise on the regime to give the Syrians confidence and safety to return, forgive and rebuild. USA doesn’t do policy,war is its language and with having the moron Trump now,all hope of diplomacy is lost,But Somehow they managed to round up 30,000 traitors in the north to prolong the fight in Syria and with the hope of taking the country to an irreversible level of restoration. Syria will start its process of healing and building when its citizens put the interest of the country before its own religion or sect,and when its leaders can define themselves by their nationality first and religions second and preferably with no religion. Poverty and ignorance have created fanatic minds and it is too early to talk about democracy when half the country is starving. A new form of colonisation is imposed on Syria by the East now,this is the price of the strategic location of the country,and it was very high,half a million were killed,infrastructure is ruined,whole generation is traumatised,injured,maimed and we ended up with a psychologicaly distorted nation. And still Zeinab seems to worry about the Sunnist future in Syria!! Allaouites were sending their children to the army after being sold as slaves for many decades to work in the sunnis household and Zeinab is in dismay why they have decided to take the lead to rule themselves and the country. That idiot president Atassi shut all the private schools run by convent and insulted the Syrian christians in the sixties,may be Zeinab should read some history. Sunnis will have no role in leading Syria by themselves in the future,so Zeinab c’est mieux si vous restez chez Macron,il adore les vieilles femmes. Dear FARES RASHID, I agree with much that you say. This regime will not change, there is no freedom to express anything by loyalty to the ruler; and many refugees will not return, especially if they can find a way to feed themselves elsewhere and get their kids educated. It is certainly not fair. I have little faith that Russia will force the regime to change. I don’t believe the regime can change without being overthrown. The system is built on loyalty to and fear of the man at the top. Which brings me to MAJEDKHALDOUN, who has been a commentator on Syria Comment for over a decade and for whom I have great respect. You are right that there will never be democracy under Assad or any important political reform. The only way I can envisage change in Syria at this point is either a coup, which I don’t suspect will happen for some time as most regime supporters and military officers would be slaughtered were the regime to fall. It would be extremely dangerous for anyone within the regime to contemplate trying to take over. The other possibility would be something along the lines of the Communist Party in Russia, where the economy, presiding intellectual environment and society changes around the regime to the point that no one believes in it any longer and its cadres are willing to try something else. This is also a long way off for Syria or the Middle East in general, where people fear for their lives and families should power change hands. In Short, it is hard to see how things change. But I would like to ask MAJEDKHALDOUN and ZAÏNEB, what they advise? What do you both believe is possible to improve the situation in Syria? What is a realistic course of action if not the one that suggested above? You know that I have full admiration to you, you asked important question , what would be the best possible solution , ? First I am against Islamic government as I strongly believe Islamists are not people who believe in freedom and true Democracy, but I recognize that the majority of Syrians are Moslem. Second Assad lost his legitimacy to rule all Syria. Third Iran has different objectives in Syria. Turkey too. Russia invested in Syria and US also invested in Syria., Russia is not pro democracy, US is in Syria to block Erdogan. I believe in the future , and by time we all will forget and forgive , and start to re unite in a democratic way. MAJEDKHALDOUN, Your proposal is intriguing. Maybe the French weren’t so crazy after all! The greatest problem with autonomy of this kind is that it would need someone to impose it and police it for some time. None of the factions would trust the other and all would want to rule the entire thing. I believe many Alawites secretly wished for such a solution during the darkest hours of the war. Possible many still do. But the felt that a state on the coast where they are a majority could not be defended. Dividing the country is also the solution the Israelis and Americans want, funnily enough, which is why the idea can be easily dismissed by both the regime and rebel camps. There will be no one to enforce it. Both sides want it all. I believe that many Alawites secretly wished for such a solution during the darkest hours of the war in 2012-2013. Possibly many still do wish it could have happened. But they felt that a state on the coast where they are a majority could not be defended. There was not way to get there, so they simply followed Assad as their only hope and asked few questions because they couldn’t see any way out for themselves or their community but to stick with the tired old Baathism that no one believes in any longer, save as a talking point to shield themselves from regime-change and to keep hostile forces from taking over. Habib, you are oddly right. America is carrying out a minority policy. By supporting Kurdish nationalism, it following the French, really, who created a separate “autonomous administration” of the Jazirah region. The belief that the United States has polarised them is ridiculous. The common denominator of Kurds and Arabs is justice, which became an enemy of the rulers for 40 years! Cry on your past! Evil rulers! Russia plays a dual role but its status is critical. We will see dramatic events in the recent entry of more countries in the adventures. 1: Russias minimal goals have been met. It has been established that Russia can act indepedently and effectively in the middle east, it has been established that Russia tends to stand by its allies (which was in doubt after Ukraine. Russia effectively backstabed the not pro western faction in Ukraine by annexing on of their main bases of support after Maidan), ISIS has been greatly weakened, and a considerable number of CIS-ISIS members have been eliminated in Syria. It is important that they were eliminated in Syria because this a) reduces the odds of their families being forced to attempt blood vengeance and b) collateral damage incurred from blowing up these CIS-ISIS members in Syria is not something Russia is overly concerned about. 2: Russias secondary goals also look pretty decent for now. Much experience has been gained for the expeditionary forces of Russia, Turkey is increasingly becoming a liability for the USA (not that they arent an issue for Russia, but Turkey was always a problem for Russia, now they are also a problem for the USA), Russias overall diplomatic position has been strenghtened (Saudi Arabia now appears to fear it, Iran actually appears to like it, which is not quite unprecedented but well, looks like we can finally move past Gullistan and Turkmenchay). 3: Kurds vs Turks will be a major issue. It seems that Russia will not support the Kurds militarily (I do not assume that direct military supports for the Kurds against a Nato country has ever been promised to the Kurds), but I think that it will not outright betray the Kurdish cause. Another issue will be making Assad see the light and agree to some level of autonomy for some Kurdish regions (Chechenya is, in practice, highly autonomous and could be an example here). I think Russia may greatly underestimate Assads unwillingness to agree to such type of deal. The Russians, not wrongly I may add, believe that whatever dissappointment the Kurds would feel about a lack of Russian support will get dwarfed by the basically inevitable American betrayal. 4: Another potential issue is within the loyalist coalition of Assad/Christians/Druze etc. The loyalists coalition did have people who have fought courageously and honorably, it also has those who spend most of the war either torturing random people or pilfering state resources. Others were so incompetent that the only way to improve their combat value is to shoot them in the head. There will be an appetite from some type of cleansing from likely sizeable parts of the Syrian army + some militia. Russian attempts to interefere there are likely (Russia takes a dim view on people who steal more then there rank allows), but could also backfire massively (I dont think Russian intel on the precise kinship ties/patronage networks governing parts of loyalist Syria is that good). Well Turkey invaded Afrin and is attacking Manbij. So great is Turkish anger about US policies. But Landis also says: ‘It would help America’s counter-terrorism goals’. There are truckloads of evidence proving the US has been for decades the main backer of Salafist terror groups like the Mujahedeen, Taliban, Al Qaeda and ISIS. I agree however the US main interest should be in rebuilding the region. It is good for the people there and it is also good for countries exporting to this region, including the US. But the US is just following up on the Israeli Odet Yinon plan to destroy the region by introducing sectarianism. The real power is it seems proven to lie in Israel.